I love a good trope-y book, and one that's a bit more meta and addresses those tropes always intrigues me. That was the main motivator for me reading this book and while I thought those elements were really fun, I'm not sure how much I really got out of this book. 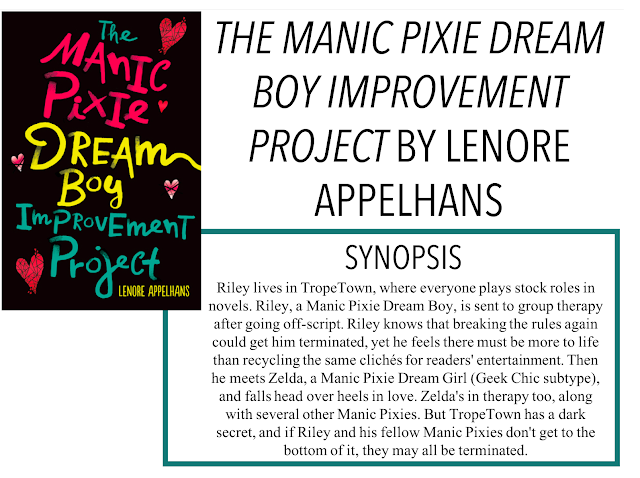 I am back with another book review, The Manic Pixie Dream Boy Improvement Project by Lenore Appelhans. Thanks so much to Thomas Allen and Sons Canada for sending me a copy of this book for an honest review, as always, all opinions are my own. 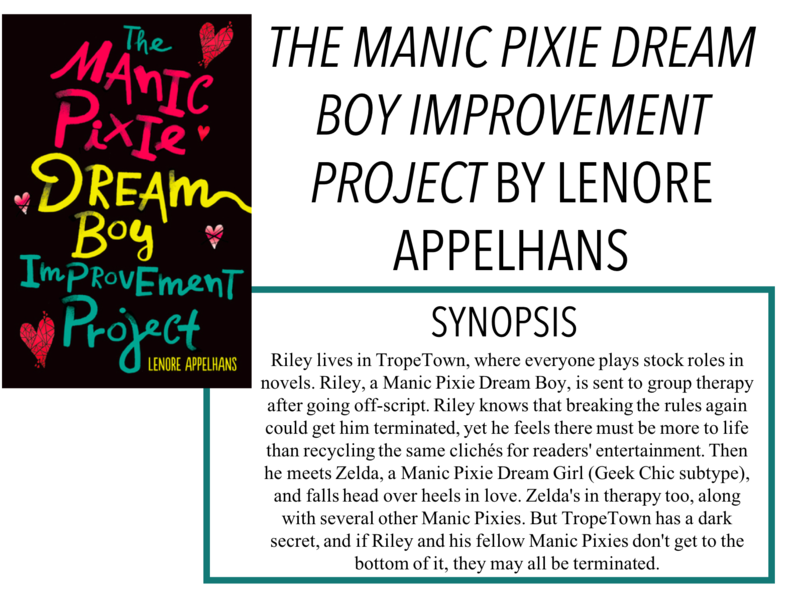 This book follows Riley (yes, it was weird reading about a character with my name, even typing that felt weird) who is a Manic Pixie Dream Boy trope in TropeTown, a place where all the tropes live until they are called into an Author's story. However, after going off-script, Riley is sent to therapy with other Manic Pixie's, including Zelda. Despite Riley's growing attraction to Zelda, everyone knows you aren't meant to fall in love with your trope. This, along with Brooding YA Hero: Becoming a Main Character (Almost) as Awesome as Me, are one of the few books that look at the many tropes and various other connections between YA novels and novels in general. The focus of this book, of course, is the MPDG or in this case MPDB trope, where the quirky, brooding character is only there to support the main character's story. Once they have achieved their goal, they are quickly discarded from the story. Written fairly well, this book was a quick read. The chapters were short, a couple pages at most, and the writing style was accessible and easy to read. I think many a reader will have no problems getting into this one. My only real problem with this book was that everything felt very... I guess surface level is the best way to describe it. There wasn't anything inherently bad about the storyline or the characters, I just felt like I wasn't really as immersed in the story as I could have been. Maybe, in some meta way, I became the outsider who didn't fully understand the potential of the MPD trope, but I feel like that might be stretching it a bit. Overall, I did like this book and if you're into the whole trope thing, I think you'll enjoy it.